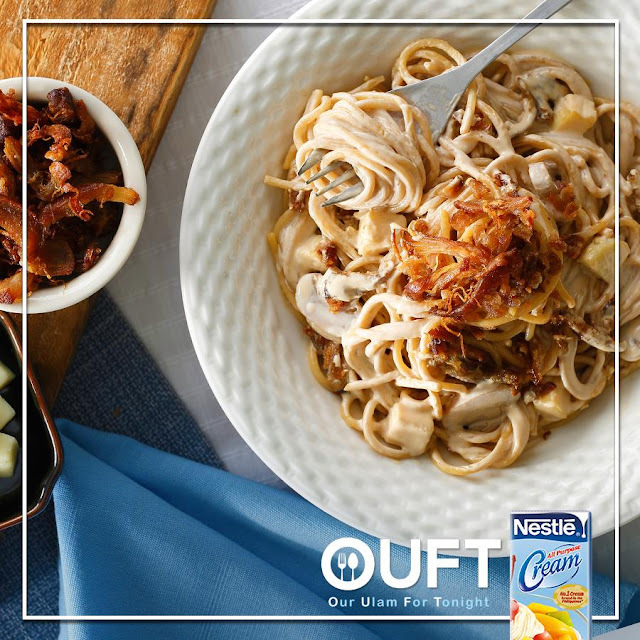 To make our ulam for tonight more exciting, why not add a new twist to this family favorite and turn it into a creamy sauce for your pasta? Try it! 1. Melt butter in a saucepan. Sauté garlic until brown. Add leftover adobo flakes and cook until desired crispness is achieved. Reserve some crispy adobo flakes for topping. 2. Add reserved adobo sauce and bring to a boil. Add mushrooms and season with Maggi Magic Sarap. Pour in Nestle All Purpose Cream and bring to a simmer. 3. Toss spaghetti into prepared sauce and combine well. Top with reserved adobo flakes and cheese before serving.